Last of Hades customized denim jacket. All of the designs have been applied on the jacket by hand. Second Collection 20 pieces are made in total. Ready for shipping within 5-8 days (Reason: we place all designs by hand once an order has been placed.) we will update you if there are any delays. 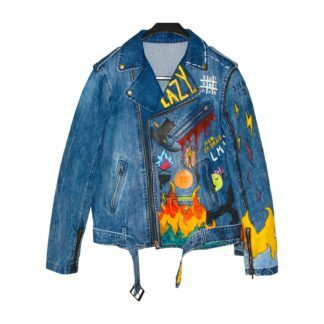 NOTE: Every denim jacket by Last of Hades has an unique look with unique designs on it, the picture gives you an impression of how one of our jackets looks like, but this does not mean you will get the exact same jacket. Last of Hades hand made denim jacket. 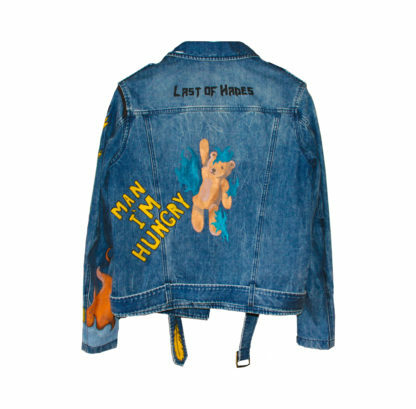 The first customized denim jacket by Last of Hades. This is an exclusive product with a limited quantity. Last of Hades will make you stand out where others will blend in. A ‘how to wash’ card will be delivered with the coat. The coat was created by team Last of Hades. Any question? do not hesitate to Contact Last of Hades.